Worst Best Picture: Is Cimarron Better or Worse Than Crash? In “Worst Best Picture” we search every single Best Picture Oscar winner of all time from 1927 to present to uncover the worst of them all. Conventional wisdom says that 2005’s winner Crash is the worst winner in history. We won’t stop until we’ve tested every last one. Read the the first, our review of Crash, here. Posts will be relatively spoiler free, but there may be some details revealed. Today’s installment is the 1930/1931 winner Cimarron. Is it better than Crash? Cimarron is an unmitigated disaster of a film. It’s slow, it’s weird, it’s boring, and it’s dated. There is absolutely no reason to watch Cimarron in 2014 aside from a desire to watch every Best Picture winner. This movie isn’t even fun to hate. The answer to “what makes it so bad” is everything, but we’ll go piece by piece. It’s the story of Yancey Cravat (Richard Dix), who is a newspaperman who also is a public speaker and is in politics and is a businessman and, honestly, I don’t know what Yancey Cravat is supposed to be. He’s mostly the editor of a newspaper in Oklahoma during the land rush of the late 1800s, so we’ll stick with that. Yancey Cravat (I can’t tell if that name was supposed to be serious or not for 1930) comes off like a madman. He’s supposed to read as a dignified, stately man in the wild, lawless West, but Dix plays him so silly that it’s impossible to feel that in the character. It’s full-on soap acting, and it’s way worse than in any of the other 30s movies. Plenty of them are bad, but none of them even approach the level of absurd, fake-deep voice that Richard Dix does in this movie. Anyway, Yancey brings his wife and his kid to Oklahoma to get some land, but he has a tough time of it. His wife Sabra (Irene Dunne, who people mostly speak well of from this movie, but I don’t see it) also has a tough time of it, mostly because her husband has 17 jobs and leaves twice for five full years, each. This is where it becomes difficult to tell what is supposed to be weird within the world of Cimarron and what is weird because we live in 2014. He just up and leaves his entire family once after killing an outlaw and once for tenuous, mostly unexplained reasons. The former I can’t imagine would be a big deal, he walks around with a cartoonishly large pistol on his belt all the time anyway, and the latter is glossed over. He’s just out, bye, good luck, y’all. No one else in the movie matters. There’s a really, really offensive black child character that rivals any moment of racism in any Best Picture winner and a Jewish shopkeeper that, well, the less said there, the better. 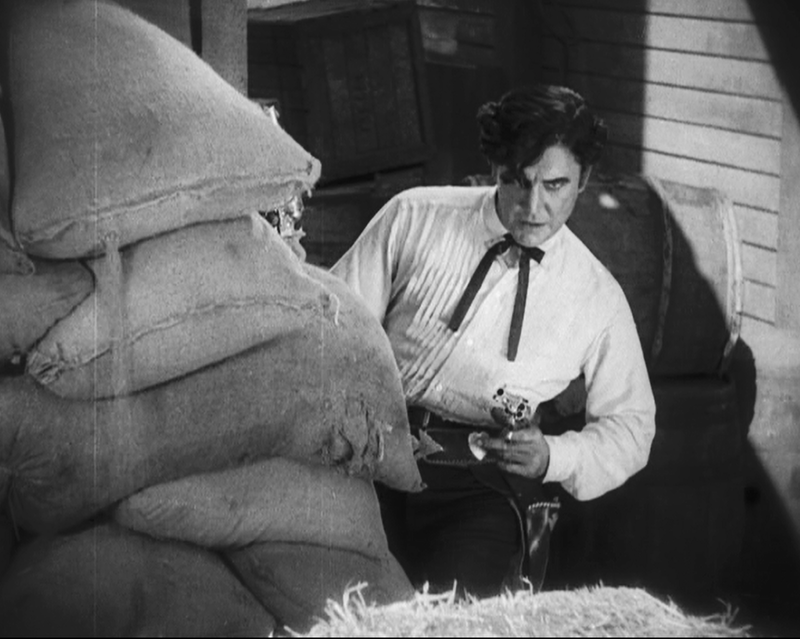 Cimarron gets hammered in modern reviews for being offensive, which it definitely, definitely is, but I think the paper-thin structure and absurd acting are even worse. For real, you should look it up on YouTube if for no other reason than to watch some of Richard Dix’s acting. Of course, a lot of this is just a sign of the times. People loved it in 1930, and most reviewers praised it for being dramatic and exciting. Those words mean different things now, and though a lot of the original Best Picture winners are strange in a kind of quaint, dated way, Cimarron is a bomb. At one point Yancey returns from a long absence to defend a prostitute in court, just… because. He hears that she’s in court and goes to defend her and it’s supposed to be a rousing, exciting moment of a good guy doing the right thing. But this is a guy who abandoned his family and came back basically that afternoon, and his first move is to go to court to defend someone. He’s also not a lawyer, but who cares, I guess? His first line is to say that the even-more-cartoonish-than-him prosecutor “is the only man in the whole Southwest capable of strutting while sitting down” and the entire courtroom including the judge and jury laughs uncontrollably for 10 full seconds. People wave their hats like he’s coming back from war, they love that joke so much. In that moment you have all of Cimarron: something that was probably pretty cool in 1930, but now is absurd at best and stupid and boring at worst. The Best Part: There is nothing to like about Cimarron. It’s pretty short for a Best Picture winner. So, I guess there’s that. There’s not much of it, that’s the best part. The Worst Part: The racist portrayals are pretty gross, but that should go without saying. I think the worst part has to be how convoluted it is. It’s possible to watch the entire movie and not really follow why everything happened. Is It Better or Worse than Crash? The only reason Cimarron is not worse than Crash is because people loved it when it came out. Everything I can find seems to corroborate this idea that Cimarron is a time capsule of what people wanted to see in the early 30s. It’s the ultimate example of those weird early Best Picture winners that were loved at the time but just don’t hold up now. It’s a mess and should be ignored at best now, but it escapes being the worst Best Picture winner because I can confirm that when Crash came out people did not love it, so compared 1:1 Crash is worse. Judged on overall quality, it’s a much harder discussion, and though there are a few to go, this might just be as close as it gets. The other major difference is that Cimarron is a confusing mess, and the worst bits of it are nonsensical. I know why everything happened in Crash, I just hate that it happened at all.